Dan Chan has secretly acquired a priceless three century old National Chinese Treasure: Bian Lian. In January of 2009, Dan moved to Asia to learn this secretive art form from a Bian Lian Master. After studying day and night for what seemed like a decade – he’d mastered the 300 second living presentation art. Bi√†n Liǎn; literally “Face-Changing” is an ancient Chinese dramatic art, where Chan is adorned in brightly colored costumes, moving to quick, dramatic music, while flourishing his arms and head- His vividly colored face (masks) changes miraculously in the blink of an eye over and over again–you must experience Chan to believe these transformations possible. 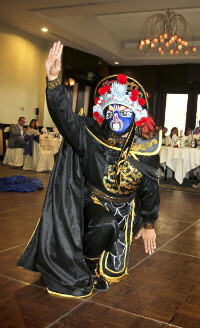 Witness Chan performing at exclusive Bay Area society and Corporate Events Internationally. Chan is often featured at events for Yahoo, Google, George Lucas, John Madden and Hollywood’s exclusive Magic Castle. Chan will present and preserve this secret Chinese art form for the rest of his life. This entry was posted in Asian Entertainment. Bookmark the permalink.